I have begun the bungalow interior this week. I have started with the dining room, which is the smaller of the two rooms on the bottom floor. 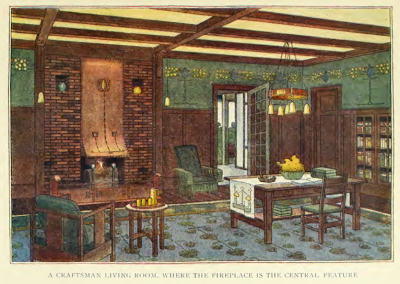 I have spent a lot of time researching arts and crafts style interiors, and come to the conclusion and high wall panels are a necessity. 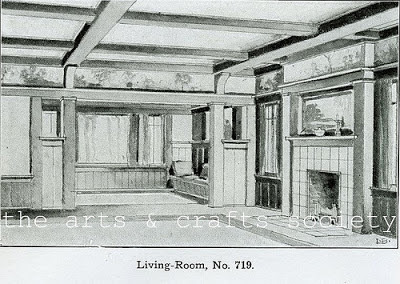 High wall panels were complimented by a decorative wall paper frieze in most homes of this time. I made the wall panels from several thicknesses of base wood ply. I then planned to stain the wood to give it a deeper rich colour. I left the cross sections of wood loose so that I could sand the main panels more easily. The cross section pieces I stained separately and will glue on once all the staining is done. I began with one layer of french polish. This first layer seals the wood so that the application of stain doesn't soak in unevenly and give a blotchy finish. I then gave it a couple of layers of stain. Now is the hard part: choosing the right wall paper! I still can't decide! It is difficult because the choice will also have to match or compliment the wall paper that I use in the lounge room next door. I have now been dwelling on this decision for four days. Some things just can't be rushed. I am very impressed! you got the arts and crafts feel down perfectly. The wall panels are superb. Whichever paper you chose will be great. Fantastic work. I love the finish! I completely understand. I don't think I could choose between these lovely papers. I'm excited to watch this build. This is a favorite style of mine. Good luck choosing the paper. Thank you so much for this most helpful tutorial. As for the wallpaper, I prefer the first one and then the last one. The first one I find quite original. I have never seen anything like it. Furthermore, the colour of the tree trunks complement the colour of the wall paneling. I find this restful to the eye. Beautiful work! 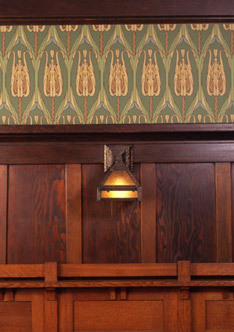 I love the first wallpaper, I think it gives a feeling of space and depth to the room, as well as being very authentic. I love that you do such detailed research! I'm a historian and a new miniaturist so historical detail is key for me. My fav is the second paper because the blue is a complement to the wood and while an entire wall in that print would be very busy, having just a bit is fabulous! I really like the last one and also the first one. Just not the third one, too wishy washy. It's got to feel right to you, though! Maybe you can have more than one if you put it on a bit of tight fitting card? Then you can keep swapping until the right one becomes obvious! Love the paneling, it's just perfectly Arts and Crafts! Did you take these wallpapers from the link you gave us in your former post? you have been busy. What lovely work, the paneling is gorgeous. Nothing worse than having to choose from so many lovely designs, they all look fabulous. Some how I was drawn to the first one with the Trees it is really unusual and looks like it's hand painted. I don't think you can go wrong with any of them though, I do think it's important to work with the room next to it, I like the look of the rooms working together as a whole when you stand back. P.S I ment to say I love those old interior illustrations, I found some that I kept as inspiration for some of my rooms, they really do give an insight to the design of the time. I have just written a post on my blog regarding panelling. I added a link to your bathroom panelling in order to show an alternative. I wish I had seen this tutorial earlier... It is a splendid work! Regarding the paper options, it is really hard to choose. The first one caught my attention, because of the colour of the trunks of the trees matching with the wood of the panels. But I like very much also the second and last one. It is no easy choice! Great work Emily, perhaps you should decide after you have started on the other room first. It is going to be fabulous I am sure. I'm very impressed with the way you created the panels. I love pictures showing the step by step process but as far as the paper is concerned, I'm not going to be much help! A lot will depend on what furniture you choose too. Anyone of those shown would be ideal. P.s, good tip about the french polish! Hi Emily! You do the most amazing wood work and I am floored with your sense of realism and the way you can break down a project into components that make the finished project so authentic! WoW! I have to say that I am most drawn to the tree frieze. The wall panels are such a rich glorious stained wood and the trees with the green above just seem to be so appropriate. What a dreamy space this will be regardless of which paper you finally choose.